An old time favourite slice that the kids will love! Heat oven to 160 C fan bake (180 conventional) and grease a square tin. Mine was rather large so I just used half of the tin. Put butter and icing sugar in a bowl and beat together until pale and creamy. Beat in egg and vanilla, then the flour. Press the mixture into the base of the tin and bake for 15-20 minutes or until golden brown. Remove to cool. Place the cold water and food colouring in a saucepan and sprinkle over the gelatin powder. Add sugar then bring to the boil, stirring until sugar dissolves. Boil gently for eight minutes, then remove from the heat to cool a little. 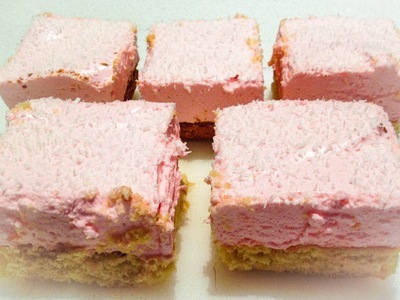 Spread marshmallow topping over shortcake base, sprinkle with coconut and leave in fridge to set. Cut into slices when cold.